Save The Clone Wars: Act Now To Save The Clone Wars! Act Now To Save The Clone Wars! Now is the time to act before it is to late. If you truly are passionate about The Clone Wars send you letters, emails, tweets and comments now. 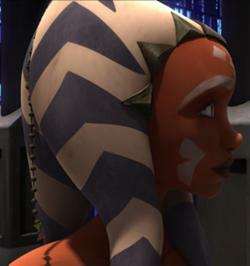 We are suggesting sending strands of beads inspired by Ahsoka's Braid along with your letters to Disney and LucasFilm. Jedi News and Rebel Force Radio reported earlier today, in the article Let's save The Clone Wars NOW - it's our ONLY hope!, that the Clone Wars team will be disbanded imminently and now is our very last chance to save The Clone Wars. "The remaining episodes that are finished or in part-production do NOT in any way wrap up the fates of the Ahsoka Tano, Captain Rex, Darth Maul, Asajj Ventress and many others. If you want these stories to be told that we must act NOW as a community before it’s too late – time is NOT on our side." Read more at Jedi News. TheForce.Net had even more dire news in their story posted this afternoon, in the article entitled The Clone Wars Team Reportedly Being Disbanded. Their sources indicate that many of the talented people who bring The Clone Wars to life will be losing their jobs, and that there is no guaranteeing we will even see the promised "bonus content." "One source familiar with developments at Lucasfilm told me that the changes at Lucasfilm Animation go beyond The Clone Wars team. This individual described a dramatic downsizing of the entire division and said that Disney planned to place future Star Wars TV projects in the hands of its existing television operation. While the source did not name names, it appears likely that veterans of the animation division and The Clone Wars in particular may be leaving the company." Read more at TheForce.Net. Make Facebook comments on Disney﻿, Star Wars﻿, Star Wars: The Clone Wars﻿, and Lucasfilm﻿. Tweet to @Disney, @StarWars, @TheCloneWars. Use the hashtag #SaveTheCloneWars! Sign the Petition Save The Clone Wars from Cancellation! Thanks for your support. 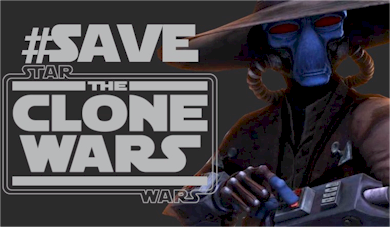 Let's #SaveTheCloneWars! can't you organize together with George Lucas a trustworthy global fundraising-project in order to hold the production-team together and to finish the production of the seasons 6 till 8? There is so much crowd-fundraising now via the Internet. For movies as well. I would spend $100 immediately. Or you offer at Amazon the pre-ordering of all these seasons. I would buy them all in advance.